Each competition or round has basically three different views: Results / Registration, Entering and Editing. This chapter explains what are the different options related to showing results on different levels on the competition hierarchy. 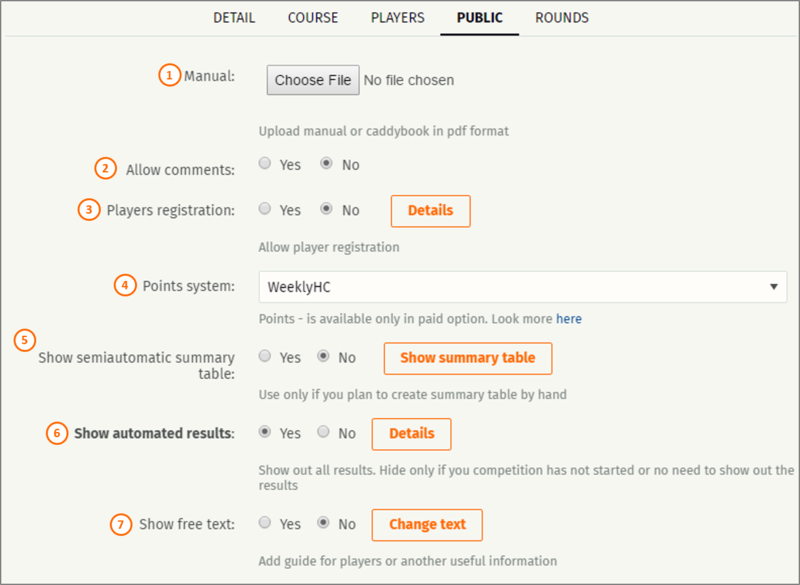 Manual: Now tournament director can include a competition manual / caddie book as PDF file into competition details. Allow comments: this setting allows users to add comments to round/competition and creates a "forum topic" for the competition. This is a deprecating feature, so it's recommended to choose "No". Players registration: results page is either showing the results or registration details. When this is set to Yes, players can register to the competition according to Details setup for registrations. Tournament director can add and remove players to competition regardless of this setting. Points system: You can select from different points systems. More information available about Point systems. Show semiautomatic summary table: This settings allows TD to create custom results table. Usually this should be set to No. Please consult Metrix support, if you need something special for your competition. Show automated results: Show the results. This and registration can't be Yes at the same time. This should be set to yes after registration is finished. And also set this to Yes on all parent competitions. Show free text: Allow TD to add a custom text, note or comments to players. This supports simple HTML and is shown below results table. This is useful for adding links to other web sites etc. More information about registration details.